Originally staffed with part-time pilots from the local Army Guard helicopter unit, RAVEN has become a self sufficient aviation unit that has dedicated deputies assigned both full and part time to flying duties. Recently, the unit’s first Tactical Flight Officer (TFO) to pilot transition was completed, establishing a precedent for internal development of pilots without relying on outside, non-sworn personnel to fly the aircraft. This allows pilots and TFOs to stay proficient in both seats of the aircraft, lending a greater flexibility to staffing the unit and accomplishing the many missions that RAVEN performs in the heart of the Sierra mountains. Flying in the Sierra mountains can be the most challenging and dangerous flying that an aviator is likely to encounter. The Sierra’s are characterized by unpredictable weather conditions, strong winds, and terrain that starts at 4,500 feet MSL and goes as high as 14,500 feet MSL. Flying in these conditions on a daily basis requires some unique skills and training. To accomplish this level of training, all RAVEN personnel are instructed in power management and mountain flying techniques. The primary missions of RAVEN are to respond to calls of crimes in progress, search and rescue missions, counter drug surveillance, Department of Homeland Security missions, and other emergencies such as fire and flood. To accomplish these wide ranging and technically challenging missions, RAVEN aircraft have been fitted with some of the latest available technologies. The OH-58 Kiowas are fitted with night vision goggle (NVG) compatible lighting, and the crews fly with the ANVIS-9 (F4949 Series) GEN 3 night vision goggles (NVGs). These devices are particularly helpful during low light nights, operating in the high desert or in the mountainous terrain that encompasses the Washoe County jurisdiction. Along with NVGs, RAVEN aircraft operate an 8000 series forward looking infrared (FLIR) system manufactured by FLIR Systems Incorporated. The FLIR is interfaced directly with Churchill Navigation’s Augmented Reality Mapping System (ARS), which overlays geospatial and mapping data on to the FLIR/video display. The two systems combined pack a powerful one-two punch for the crews, greatly decreasing workloads and enhancing their situational awareness tenfold. Rounding out the standard configuration for these aircraft is a Spectrolab SX-16 Nightsun searchlight which is a highly effective tool that provides greater safety and awareness to ground units. The system can light up a football field sized area from 500 feet that crooks can’t run fast enough to get out from under the light beam. The final piece of the technological puzzle is a Broadcast Microwave Services’ video downlink system that interfaces directly with portable receivers and a receiver in the Sheriff’s state-of-the-art Mobile Emergency Operations Center. It allows commanders on the ground or officers in the field a birds-eye view of the tactical picture, giving them a significant advantage over the criminal. Finally, all RAVEN aircraft are fitted with high skid landing gear to allow for offsite landings in high brush, grass, and snow common in the high desert. The patrol aircraft, the OH-58 Kiowas, in the above configuration have racked up some impressive numbers over the years, especially given the small size and limited flight hours of the unit. Averaging only 450 hours a year for dedicated patrol flying, RAVEN responds to over 1,000 calls for service annually, arriving first on scene in 70 percent of those calls. RAVEN also clears hundreds of calls a year, freeing up ground units for other higher priority calls. In 2011, RAVEN saved over 500 man hours by clearing calls for ground units. But the Kiowas aren’t the only regional asset available to the community. The HH-1H Huey operated by RAVEN is a one of a kind asset that has proven to be invaluable to Washoe County and it’s neighboring counties. 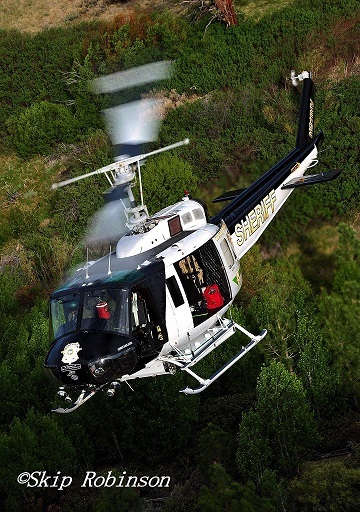 Legislatively mandated to provide Search and Rescue (SAR) services, the Washoe County Sheriff has defined one of RAVEN’s primary missions as that of SAR. To enhance its’ SAR capabilities, the aircraft has an internal Goodrich electric hoist with 250 feet of useable cable. The SAR missions that RAVEN launches on range from missing hikers and hunters to drowning juveniles and stranded snowmobilers. 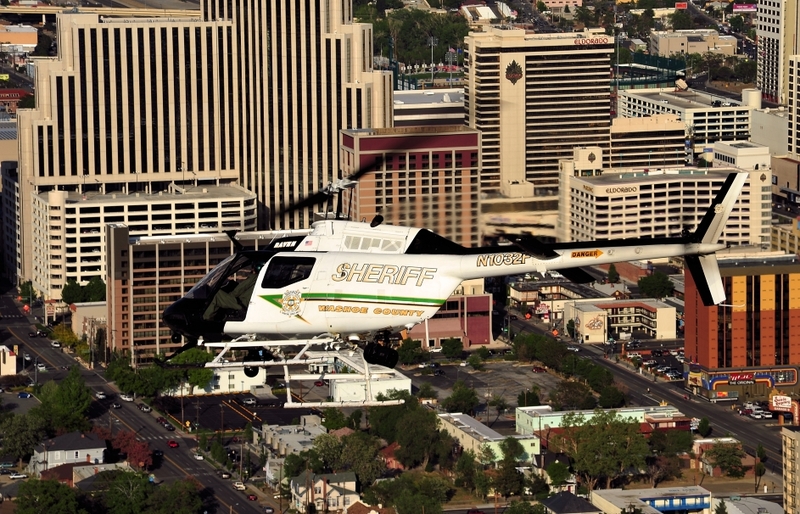 As the only law enforcement aviation asset in northern Nevada, RAVEN has become a valuable partner to many of the neighboring counties and states when citizens are in need of help. RAVEN crews are often the only asset available no matter what day or time they are called. To augment their skills, RAVEN crews are trained in high altitude technical rescue, and partner with the Washoe County Sheriff’s Search and Rescue volunteers to accomplish these often times treacherous rescues. In the summer, the Huey changes its primary role to that of firefighting. Fitted with a belly-mounted water tank that is able to carry 323 gallons of water and 27 gallons of foam, the Huey has become a tremendous asset for the Truckee Meadows and the surrounding Sierra’s, which are so often impacted by wild-land fires. Approval to fight fires on federal lands was the culmination of a nearly three year long inspection process for the aircraft, maintenance practices and pilot check flights. Receiving final approval in 2011, RAVEN’s first fire season resulted in over 20 wildland fires fought, with nearly 80,000 gallons of water dropped on those fires. By all accounts, a spectacularly successful first season that resulted in millions of dollars of property saved from the ravages of wild-land fires.